The human parechovirus (HPeV) has resulted in more than 200 hospital admissions since December and a mum whose baby nearly died from this dangerous bug is warning other parents to be aware of its symptoms. Mum-of-three Ali Tessier became concerned about her newborn son Louis’ wellbeing when he just wouldn’t stop crying. “I just started to have a bad feeling that something wasn’t right,” Ali told 9 News. Determined to get to the bottom of things, she rushed her little boy to hospital, but Louis only had a slight temperature and doctors couldn’t pinpoint why he was feeling so unwell. 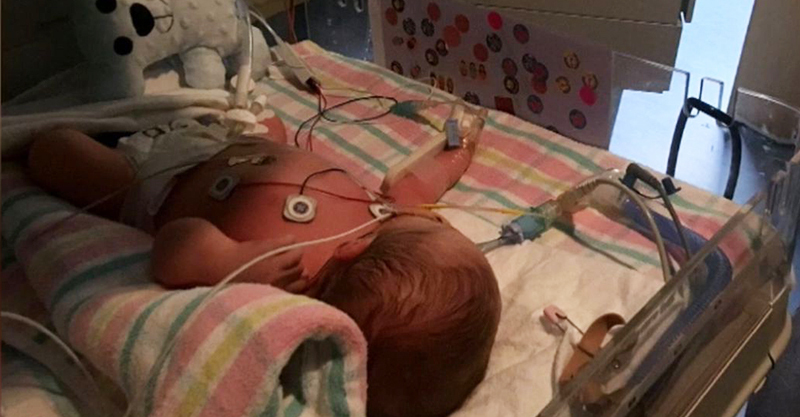 Thankfully they didn’t send this mum and baby home – as is so often the case – instead carrying out a series of tests that would determine he was infected with parechovirus. Things went downhill very, very quickly, but thankfully Louis was surrounded by medical staff as he deteriorated. “An hour later he had a huge seizure, he stopped breathing, and they had to rush him up to intensive care,” Ali recalls. In severe cases, human parechovirus can affect the lining of the brain, causing the type of seizure poor Louis experienced. Children younger than six months are particularly vulnerable to HPeV. The virus has been re-emerging every two years since 2013, The Medical Journal of Australia reports. “It was just so frightening because every time a doctor would come in I think, ‘oh my gosh, what are they going to say and am I going to take my baby home? '” Ali remembers. Ali didn’t get to take her baby home for quite some time, as he became so ill he spent six days on life support, before turning the corner and finally beginning to get better. Thankfully Louis is well on the mend now, nine months later, but his vision is impaired and the virus has had some other health implications too. “It’s really heartbreaking because you bring a perfectly healthy baby into the world and now we just have hope that he can learn to see,” Ali told 9 News stressing that parents should always go with their gut and head straight to the doctor or hospital if they’re concerned about their children’s health. What is parechovirus – and how bad can it get? Parechovirus is a type of virus which is closely related to enteroviruses. These viruses are usually quite mild, but in some cases can be very severe. An enterovirus is a virus that gets into the body through the mouth and is then absorbed via the gut (‘entero’ means intestine). Parechovirus can be particularly dangerous in young babies. “It is now recognised as a leading cause of sepsis-like illness and central nervous system infection, particularly in young infants,” Professor Allen Cheng of Melbourne’s Monash University revealed. Parechovirus is spread from human to human via the saliva, mucus, phlegm or faeces of infected people. “There is currently no evidence to suggest particular concern regarding infection in pregnant women or foetuses,” The Medical Journal of Australia says. What are the symptoms of parechovirus? “Rates of the human parechoviruses (HPeV) have reached ‘epidemic’ levels and infants and children who contract the infection need closer medical attention by doctors and ongoing follow-up,” the The Medical Journal of Australia recently reported. There is no vaccine and there are no effective antiviral therapies for parechovirus. Treatment is primarily supportive, and may involve the management of complications associated with the virus. Good hygiene is the best way to prevent the spread of parechovirus. thorough and frequent hand-washing, especially before eating, after using the toilet, changing nappies or wiping noses. Kids with this virus must be kept away from other children, childcare or school while they are unwell.